Is cauliflower the new kale? It seems to be popping up everywhere lately. I’ve seen it roasted alongside farro, mashed up like potatoes, tempura battered and fried and ground up and used in pizza crusts. Since I haven’t ever really prepared cauliflower before, I decided to do a simple slice and roast in a cast iron pan with some toasted sesame oil. The taste and texture here was delicious: it was perfectly crispy and caramelized around the edges and soft yet toothsome towards the center. I decided to top it off here with some sriracha-Vegenaise dressing, but it can also be served plain with the toasted sesame oil it’s been roasted in. Make your cauliflower slices by removing the green leaves and most of the stem from the base. Leave some of the stem intact so the cauliflower doesn’t fall apart. Then, place the cauliflower, stem side down, and slice into the center with a large knife. Slice again on either side to create two flat pieces. Rinse and pat to dry. Reserve the small and broken florets for using later. Place 1 tsp of sesame oil into the bottom of a cast iron pan. Place the cauliflower pieces into the pan, then drizzle the remaining 1 tsp of sesame oil over the cauliflower. Sprinkle with the salt and pepper. Place into the oven to roast for 20-25 minutes, checking after 20 minutes. Once it is nicely browned around the edges, carefully flip the pieces over and roast for 20 to 25 minutes more. It’s done when the edges are all perfectly crisp. Whisk the Vegenaise and sriracha together, adjusting the heat level to your taste. 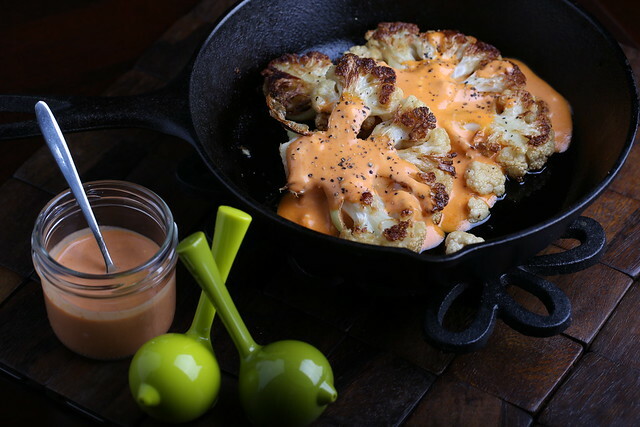 Drizzle over the cauliflower and serve immediately. The edges are the best part! OMG Looks amazing! Will have to make this! Beautiful shots!! This recipe sounds super tasty, not to mention really easy-to-make. 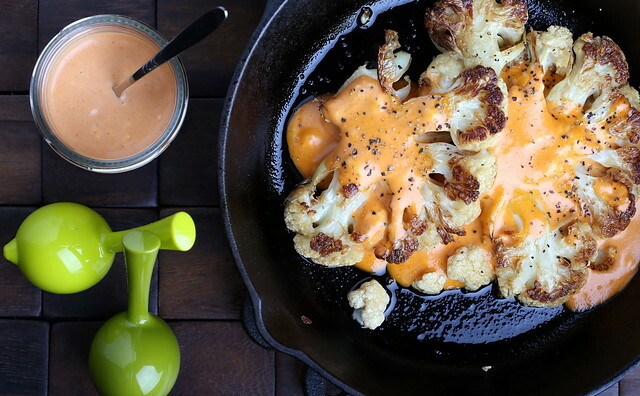 I definitely have to get on making that vegenaise-sriracha dressing! Thanks Jackie! Vegenaise-sriracha is the best tasting stuff ever. mmm this looks so simple and amazing! adding to my must-try list! "Reserve the small and broken florets for using later." I thought this was what you ate while dinner was cooking?! Sounds awesome! I just got some cauliflower in my CSA box and was trying to figure out what to do with it. This sounds perfect!! Thanks for posting! So glad you enjoyed, Iilona — and thanks for letting me know! Wholy moly! I don't even like spicy foods, and that is delicious! What a wonderful dinner you helped us put together. I guarantee my hubby will be putting that sauce on a lot of things now. Glad you enjoyed! Sriracha-Vegenaise sauce is magic. I think cauliflower is the new cashew. Like raw cashews, cauliflower is so versatile! I love what you've done with it. 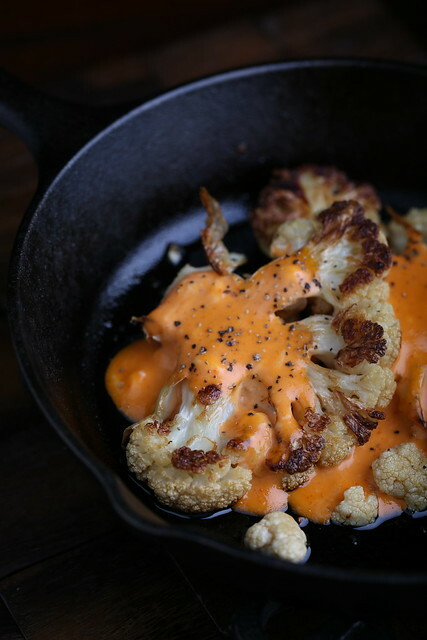 It looks absolutely gorgeous, and I can imagine the way that a sizzle in the cast iron skillet makes the nuttiness of the cauliflower shine. It is! I haven't bought cauliflower until recently, and now I want to use it in everything! Just bought 2 heads today! OMG making this! Thank you.